The casino itself is medium sized, clean and handsome. We agree with the reviewer who says it is one of the nicer ones we have visited. It is easily walkable from all parking areas. Lots of slots, decent games. Non-smoking room is sort of an afterthought. Nice lounge, though a little unorganized: there were signs on the bar advertising the featured cocktail, a French 75; bar staff had never heard of the drink. They had to struggle to find someone who knew about it, and the result was not a well-made drink. We did not eat in any of the restaurants, but they looked pretty standard issue. The RV parking area is not significantly farther away than the car parking. There are three level concrete back ins with cement slabs and patio aprons! Not sure how big a rig these could accommodate: we were in a 21 foot motor home. There are also five pull-throughs that can easily accommodate big rigs. These sights are more or less level. No hook-ups. There is a grassy area behind parking lot, suitable for dog exercise. There is a moderate stream of car traffic past the RV area. There is good light, and trash cans. 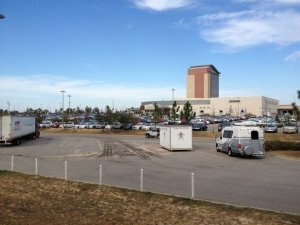 There is also a second parking lot designated Truck Parking farther behind the casino. These are all pull-through spaces, pretty level. There is a smaller, hilly grassy area behind parking lot. There might be less noise back there, but it was less inviting than the RV area, so we did not park there. We saw smaller class B RVs in the regular parking area. I suppose you could go there to be closer to the doors, but the car lot did not look as level as the truck or RV lots. In the RV area, there was a strong, free, wi-fi signal.